Koopa Bros. Fortress is a fortress that was once home to Bob-ombs but was taken over by the Koopa Bros. prior to the events of Paper Mario. The Koopa Bros. first traveled here in search of excitement, finding their native home of Koopa Village too boring. They were apparently well-received by the fortress's Bob-omb inhabitants at first, although Kammy Koopa's admiration of them corrupted them into the vain and evil characters players are familiar with and even made them turn up against the Bob-ombs, enslaving them. 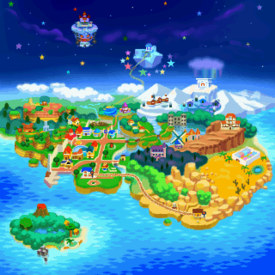 In Chapter 1, Mario, Goombario, and Kooper travel here from Pleasant Path to find the first Star Spirit, solving several puzzles and fighting enemies such as Koopa Troopas, Paratroopas, and Bob-ombs. On the way, one of the Koopa Bros. traps them in a cell, where they meet Bombette (as well as several other imprisoned Bob-ombs who had previously risen up against the Koopa Bros.), who makes an escape route by exploding. They reach the Koopa Bros., defeat them, and rescue Eldstar, the first Star Spirit. Very little is known about the origin or purpose of the Fortress, as little history is given in Tattles and other sources. According to Goombario, Koopa Bros. Fortress was first erected by an unknown group around the same time that Bob-ombs began inhabiting Pleasant Path (which was said earlier in Paper Mario to have been not long before the game's setting), and that the Bob-ombs soon took over the fortress from its creators and became its caretakers. The fortress was in ruins, suggested to be a consequence of frequent Bob-omb detonations by Goombario, and was restored to a functioning state by the Koopa Bros. In volume 26 of Super Mario-Kun, Mario and his partners encounter the fortress later in the story compared to the games. For enemy formations in Koopa Bros. Fortress, see here. Fortress Key Held by the Koopa Troopa in the first room. On the west end of the basement, which can be accessed by lowering the stairs in the east. Locked behind bars on the first floor. Mario can get it by blasting the wall with Bombette. Locked behind bars on the first floor. Mario can get it by lowering the stairs on the second floor. Power Bounce Locked behind bars on the first floor. Mario can get it by blasting the wall or enter from the back side. Refund In a small area outside the fortress that can be accessed by blasting the wall on the east end. Smash Charge At the end of the slope stair on the third floor. Maple Syrup At the Bullet Bill dodging scene, in a question block at the southwestern corner. This is the fortress where the Koopa Bros. are holing up. One of the Star Spirits was held here by the Koopa Bros. This fortress was originally the home of the Bob-ombs. If we continue along the pass, we should reach Koopa Bros. Fortress. Many Koopas and Paratroopas live around here. If they're loyal to Bowser, they'll definitely attack us. Just east of here, we can see Koopa Bros. Fortress. Actually, we're probably already on fortress grounds. That arch certainly looks like part of it. And there are lots of bad guys, too. Here's Koopa Bros. Fortress. This used to be ruined, but I guess the Koopa Bros. rebuilt it. It looks pretty huge, huh? And solid, too. This fortress was originally built around the same time the Bob-ombs took up residence on Pleasant Path. It's pretty chilly inside this fortress, isn't it? It must because there's so much water inside. This fortress stays cool all the time because it's built entirely of stone. This seems to be the central area of the fortress. This area looks extremely suspicious to me. I wonder what all those gates guard, don't you, Mario? I heard there are many tricky parts of this castle. I wonder who built it. It's pretty curious looking. It looks like they turned this large chamber into a prison cell. It seems strange to keep so much water in the building. Do you think it's here to keep Bob-ombs from burning the place down? Or maybe it's just for Koopas to bathe in. I mean, it's nice that it keeps the place so cool, but I'm still suspicious... Mario... Let's keep moving, huh? These fire bars are a menace! They're hot to the touch. They'll hurt you if you touch 'em. Somebody said there's a way to destroy 'em. How do you think we do that? This place is pretty huge. Before the Koopa Bros. came here, this place used to be filled with Bob-ombs. I don't think the Bob-ombs built it, but they became its caretakers. Of course, they explode all the time, so you can see why there are so many cracked walls. Boy, the air is refreshing up here, huh? And look at the view! Isn't that Pleasant Path way down there? This is the room where we fought the Koopa Bros. Those guys weren't so tough! They certainly weren't a match for us, huh, Mario? Bombette blowing up a cracked wall. Black Koopa Bro alarmed at Mario's presence. Green Koopa Bro setting up bars. Yellow Koopa Bro setting up an item box trap. Red Koopa Bro leading the Koopa Bros. with one last defensive push. German Festung der Koopa-Brüder Fortress of the Koopa Bros.
Nuòkù Xiōngdì Yàosài Noko Brothers Fortress. Noko is from the Japanese name for Koopa Troopas, nokonoko. In the demo movie on the title screen, Mario and Parakarry are shown avoiding the Bullet Bills fired from the Bill Blasters, which only appear prior to the fight with the Koopa Bros. However, this cannot be done in-game, as Parakarry does not join Mario's party until after the Koopa Bros. have been defeated. This page was last edited on February 26, 2019, at 21:02.